2 items re: AI’s potential impact/place within education “The global companies that failed to adapt to change.” [Rao] | DC: Higher ed likely has something to learn here. 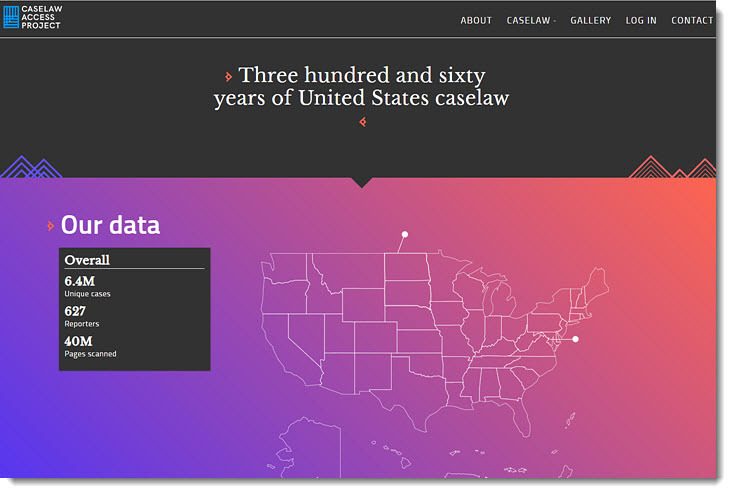 [On 10/29/18] the Library Innovation Lab at the Harvard Law School Library is excited to announce the launch of its Caselaw Access Project (CAP) API and bulk data service, which puts the full corpus of published U.S. case law online for anyone to access for free. Between 2013 and 2018, the Library digitized over 40 million pages of U.S. court decisions, transforming them into a dataset covering almost 6.5 million individual cases. The CAP API and bulk data service puts this important dataset within easy reach of researchers, members of the legal community and the general public. To learn more about the project, the data and how to use the API and bulk data service, please visit case.law.